I have a lot of pictures to upload from the beach and I am slowly working through them cropping and whatnot. I can't help but share along the way. 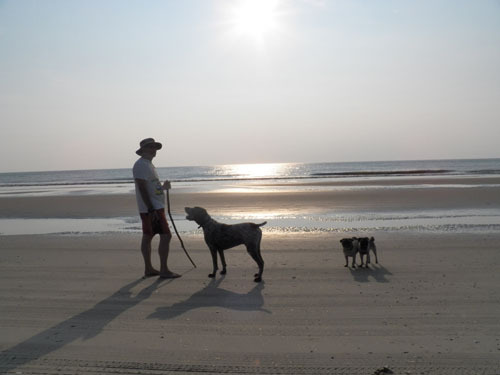 Each morning at the beach I got up early with my dad and the pups. Those who know me well know what an accomplishment this is. I am not good at getting up early. At the beach though - it works out ok. There are two times of day I love to take pictures. Sunrise and sunset. The light is unique. Morning light to me seems extra sharp and prone to contrast. Sunset light seems warmer and softer. Maybe it's all in my head. Look how Oscar and Hugo are standing side by side in the above photo - cracks me up. 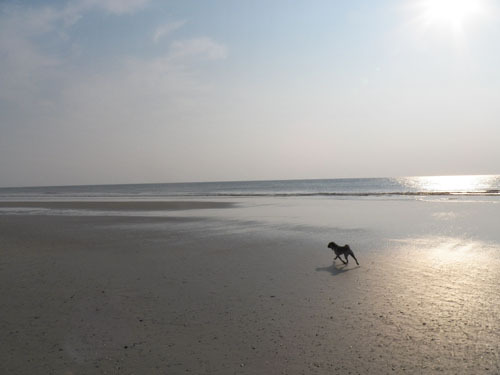 During the early hours of the morning on the beach there are few people around and we can let the dogs run free. Hugo sprints like a racehorse. He loves to tease Wally until Wally chases him. I am not a morning person but I am glad I got up to capture these photos. These are for my Day 15 of 30 Days of Creativity. Awesome shots of the scenery and the dogs. The shots are amazing. 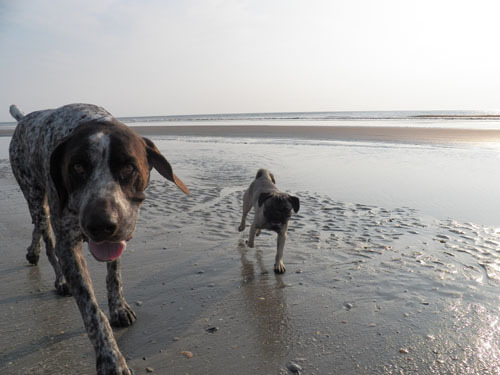 Dogs love the beach as well. I love going to beach. I've visited a lot of beach resorts and I always enjoyed my stay in it. This is also true when I visit resorts and beach clubs. What I like most is the hotel accommodation. If the hotel gives a very good accommodation, I always make sure to go back to that resort or club every year. It is always a fun adventure to just leave your car at the parking at perth airport and go anywhere around the world and have a relaxing vacation. Beaches are my favorite vacation spot too. It is where I feel most relaxed.